Often people don’t know how to eat Toasted Turkish Pide Bread, some slice it into thin bread soldiers and eat it with dips. Some use it for making delicious sandwiches. My favourite way is to cut them in half and make them into open faced toasted sandwiches, with various toppings. I view this as a breakfast toast with fancy toppings! 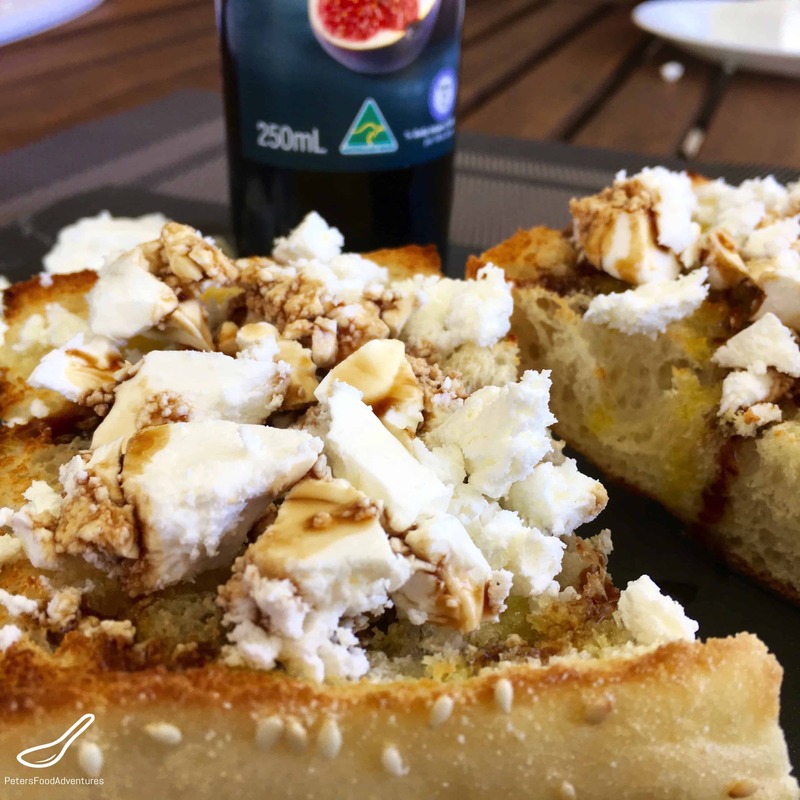 Toasting Turkish Pide Bread with Feta & Caramelized Fig Vinegar is the perfect combination of creamy, sweet, sharp and sour. Caramelized Fig Vinegar is a type of finishing vinegar, which is similar to Balsamic Vinegar, only better! It’s used as a glaze, in salad dressings, marinades, and to anything that needs a flavour punch! Other popular flavours are Raspberry Finishing Vinegar, Spicy Beet Finishing Vinegar, Blood Plum Finishing Vinegar and Black Cherry Finishing Vinegar. Any of these flavours work with this recipe. You can find these vinegars Gourmet stores, continental delis, online, I bought mine at Aldi. Remember to use a good quality Extra Virgin Olive Oil. Be generous when pouring it on your Toasted Turkish Pide Bread. 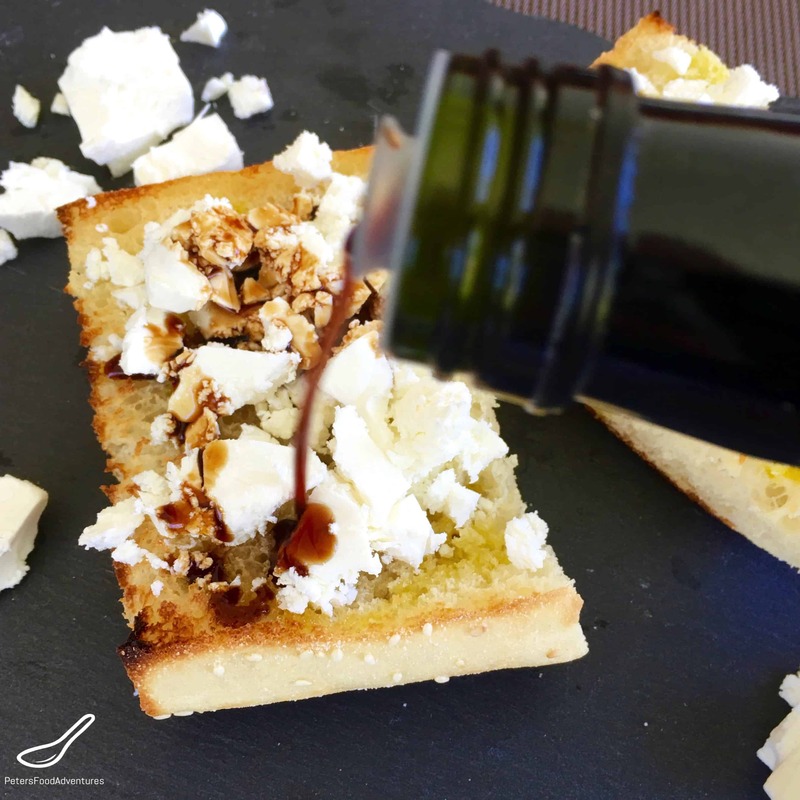 Think of it like butter on toast, except it’s easier to pour EVOO instead of buttering toast, plus tastier and healthier. This recipe is similar to my Toasted Turkish Break with Feta and Olives, both are family favourites. 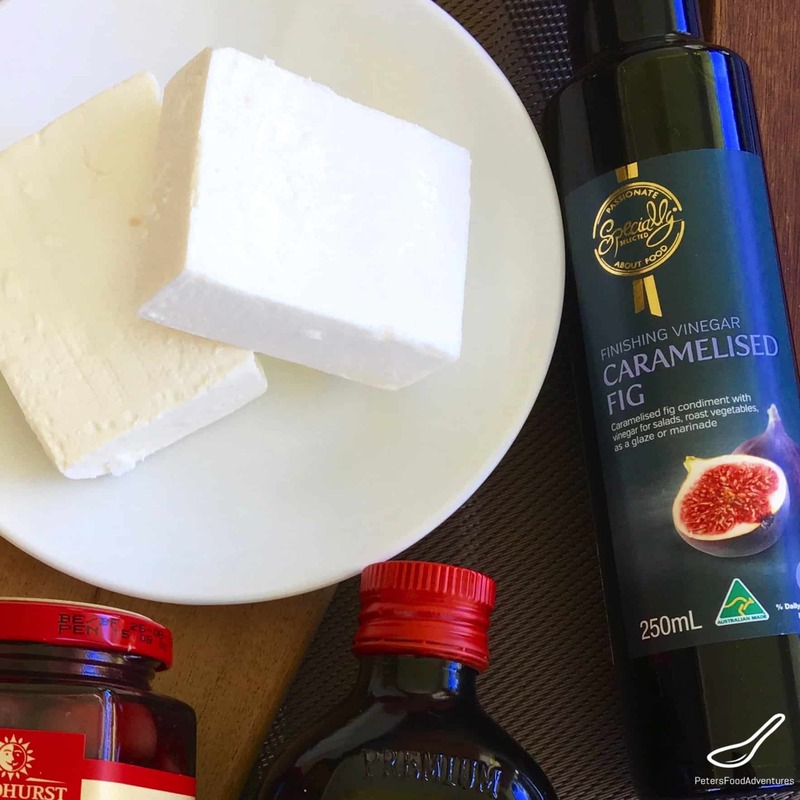 Toasted Turkish Bread with crumbled Feta, generously slathered in a delicious flavoured finishing vinegar is an amazing breakfast, delicious lunch or easy snack. Bon Appetit! Приятного аппетита! Slice the Turkish Bread in half lengthways and toast in a toaster until golden brown. 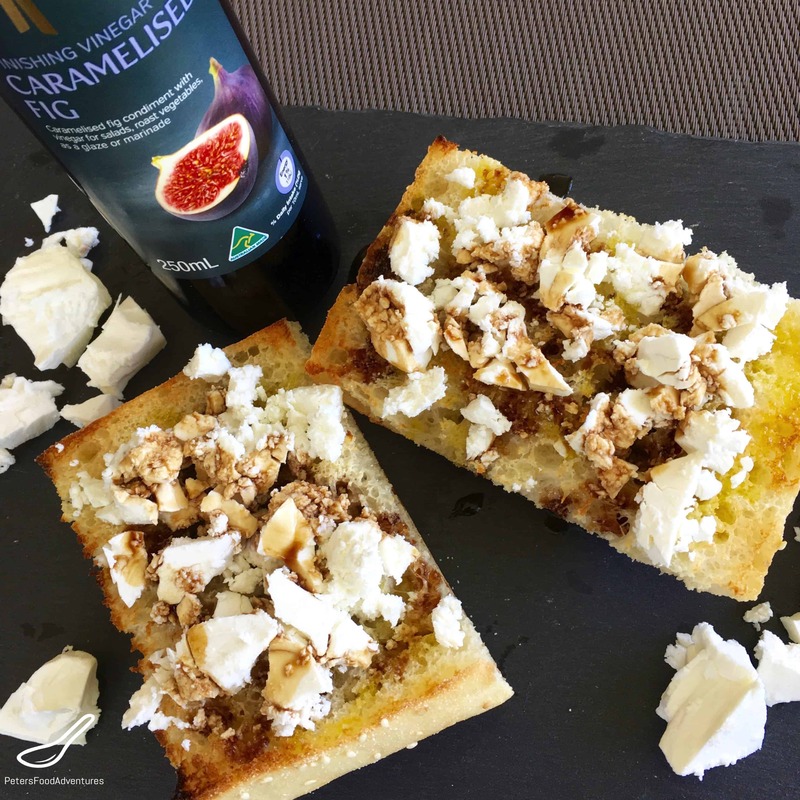 Crumble Feta Cheese on the Turkish Bread, drizzling with Caramelized Fig Vinegar. Toasted Turkish bread sounds delicious. Do you have a good recipe for the bread itself? I have never made it, but there is a Turkish Bakery down the road where they bake it fresh daily (amazing) and I should go and have a chat with them and learn how to make it! Will add it to the list of future recipes! Stay tuned! ??????? ?